Rich Text Format, or RTF, is the internal markup language used by Microsoft Word and understood by dozens of other word processors. RTF is a universal file format that pervades practically every desktop. Because RTF is text, it's much easier to generate and process than binary .doc files. Any programmer working with word processing documents needs to learn enough RTF to get around, whether it's to format text for Word (or almost any other word processor), to make global changes to an existing document, or to convert Word files to (or from) another format. 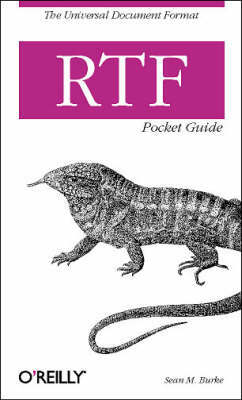 RTF Pocket Guide is a concise and easy-to-use tutorial and quick-reference for anyone who occasionally ends up mired in RTF files. As the first published book to cover the RTF format in any detail, this small pocket guide explains the syntax of RTF with examples throughout, including special sections on Unicode RTF and MSHelp RTF, and several full programs that demonstrate how to work in RTF effectively. Most word processors produce RTF documents consisting of arcane and redundant markup. This book is the first step to finding order in the disorder of RTF.